Michael Fassbender is quite the talented gent. He pulled us in as a young Magneto in X-Men: Days Of Future Past, terrified as a sadistic slave owner in 12 Years A Slave, and proved he could still own the screen while wearing a big ol’ fake head in Frank. But can he pull off Steve Jobs? Hell, can Seth Rogen pull off Woz? We’ll find out in October. After being dumped by Sony and once-lead Christian Bale, Universal Studios has announced that its Steve Jobs film is set to open on October 9th. Written by Aaron Sorkin (of West Wing, Newsroom, Moneyball, The Social Network, and a million-other-things-you’ve-probably-seen fame), the film is said to take place primarily in just a handful of locations: Jobs’ garage, a restaurant, and behind-the-scenes at three product launches. The crew spent quite a bit of time in and around De Anza college, where Jobs launched the second-generation iMac in 1999. 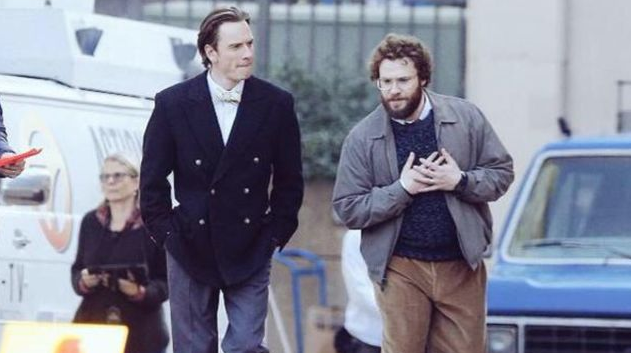 Even with on-set pictures like the one above having leaked out in recent weeks, it’s tough to imagine Fassbender as Jobs. At least in The Social Network, Jesse Eisenberg sorta looked like Zuck if you squinted hard enough. Harder to imagine than Fassbender as Jobs, though, is Fassbender taking on a role that he doesn’t just absolutely crush — so there’s still hope yet.